I loved the bright colour clash of the blue sticker on the red postbox. But I also liked the words on this sticker, referred to Women’s Day on March 8th. 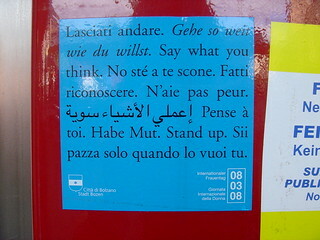 I especially like the last sentence "Sii pazza solo quando lo vuoi tu", be only crazy when *you* want to be.